Your little one has finally arrived. You want the best for the tiny cherub, and you cannot stop yourself from fussing over everything at home; the onesies, the diapers, the baby products, and baby’s sleeping arrangements. While you have a crib in the nursery, where are you going to put your infant down for a nap during the day, when you are busy with your routine chore? You’ve got to have something that is comfortable, safe, and portable around the house if you want to keep your eyes on your precious prize. We present to you 8 of the Best Baby Bassinets that are on offer in the market. You’ll thank us for bringing you choices that are cozy, comforting, and peaceful while also packing in the best safety and utility feature. 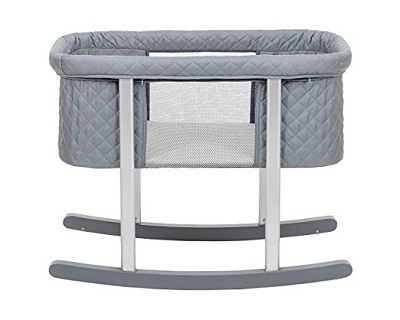 We have weathered the bazaars of the world to bring you this list of bassinets to keep your fuzzy little angel warm and content even when they are not in your arms. Let your infant get the most restful sleep in this snug bassinet that will become baby’s buddy in no time at all. You can rock your angel in this bassinet while you sing them to sleep. Fitful sleep can reduce the blues in babies by fueling them with the energy required to explore their new environment. Since your baby is going to go through a sensory excess, being in a safe and sheltered space like the bassinet can do wonders. 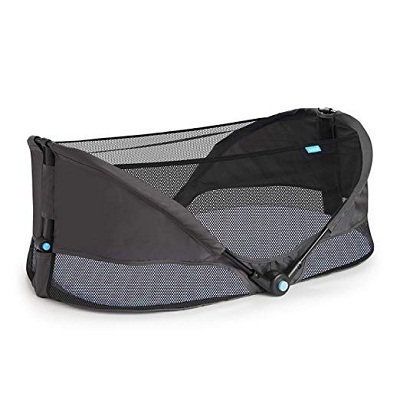 This is a portable bassinet that comes with a one-second open-and-fold system for your convenience. It is encircled in a breathable mesh that will give baby ample viewing opportunities while looking around. It comes with a rock mode to comfort baby and a stationary mode for when the baby is asleep. It folds into a compact carry on with a carry bag included. It comes with a mattress pad included and has a supporting frame. You have to buy fitted sheets separately for this product. You will love this 2 in 1 bassinet for its functionality and dual mode option. It is spacious on the inside and can comfortably be placed in any place of your choosing. Your baby will have the best smile to give you after resting in this multi-functional product. 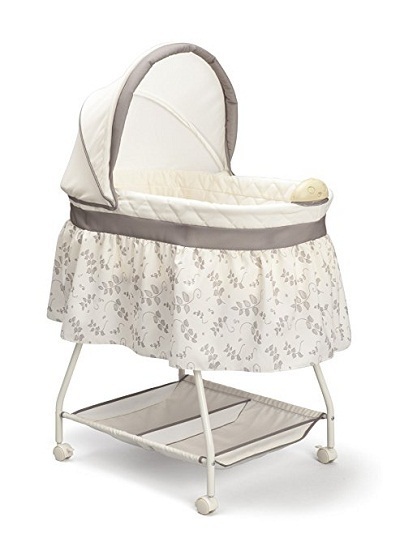 This elegant bassinet for baby features serene, nature-inspired patterns and sophisticated fabrics. It comes with a chic outline that will effortlessly fit into any part of your home without countering your home décor. It comes with pre-loaded lullabies on a music module, and it has a nightlight for convenience. Delta Children has been delighting with sleep spaces for infants, and you will not be disappointed with this one. 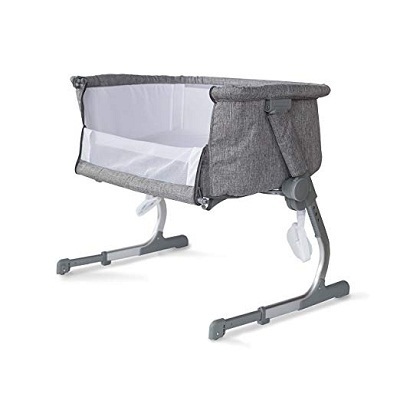 The Delta Children bassinet is a serene space, and it is the best place for a newborn to sleep. It comes with an adjustable, removable canopy to prevent light from disturbing your baby during the day. It also has caster wheels for ease of mobility, and it comes with a 90-day warranty. The music module comes pre-loaded with some lullabies. There is a section storage basket below the bassinet to store all of baby’s essentials. 3 AAA batteries are required to run the nightlight and music module,and they are not included with the product. The Delta Children bassinet comes with a sense of style while packing all the comforts that your baby will need. Its steel frame is strong and can handle up to 15 pounds of weight, while the polyester fiber pads are cushy and as snug, as it can get. The Halo swivel sleeper is the best bassinet we have come across because of its exciting swivel feature. Baby will never sleep better, thanks to this 360-degree rotation feature which is soothing yet tremendously safe. The Swivel Sweeper comes with sidewalls that can be locked or lowered according to your convenience. This will allow you to take care of the baby even while you are still lying in bed. It comes with a steady 4-point base, and height adjustment feature to that fits most beds between 24” to 34” in height. The base tucks under your cot easily and is ideal for small spaces too. The swivel feature makes getting in and out of bed easy without having to pull and push the entire bassinet each time. There are no castors or wheels and portability may be reduced. This bassinet is a co-sleeper bassinet and you will be able to keep a watch on your tot while you are still in bed. You will enjoy being able to reach for baby from your bed thanks to the flexibility that the side walls provide. This is one of our best mesh bassinets. It comes with breathable fabric and a frame that locks to provide security. You baby will dream of soft fluffy candy and pretty daisies while securely tucked up inside this secure travel bassinet. The Brica travel bassinet comes with double locking steel frames and a 4 point Safe-T-Lock system that are durable and strong. The fabric is machine washable and the mesh allows for maximum air flow. The product includes cushy mattress pads and fitted sheets. It is slim, weightless and conveniently portable. You will have to use the bassinet only on flat surfaces and it cannot be used on an elevated surface for safety reasons. Brica is a secure sleep haven for your baby when you are on the go. You can use it in the park or while you are at your workplace and still provide your little one with the relaxed environment that they get in the comfort of your home! Move over portable bassinets! The best baby sleeper has just been bestowed upon travelling parents. 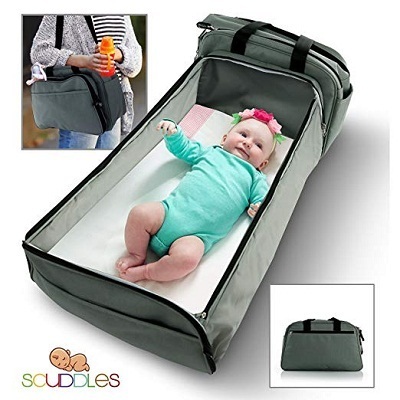 Scuddles presents its 3 in 1 travel bassinet that is also a diaper changing station and a diaper bag. Peace of mind and comfort come knocking at your doorstep as you pack to go out some place. The Scuddles bassinet converts into a unisex multi-functional bag that can hold all your infant’s essentials. It comes with some sassy features that converts it into a comfortable bassinet accompanied by mattress pads. It is trendy and comes in a neutral color that makes it easy for mom and dad to carry it around. The bag comes with 5 compartments that can store a lot of essential items. There is a mattress pad that can be alternatively used as a diaper changing pad. The bassinet sets up in just 30 seconds. The product is available only in a single color-Grey. You are going to be excited about the insulated bottle holder. It will keep baby’s milk warm or cold, while you are on the go. The bassinet travel bag also comes with sticks that help transform your bag into the most comfortable bassinet for your little angel. Beside Me bassinet is an option that will help further the intimate bonding between mother and baby even during sleep time. 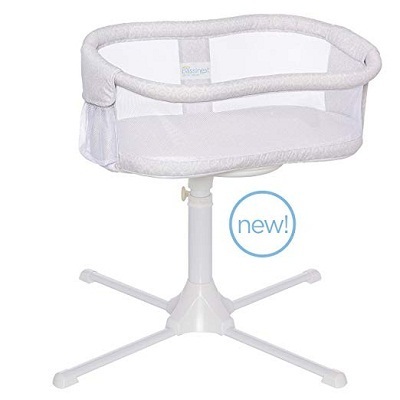 The baby bedside bassinet mode brings with it a breathable mesh that enables airflow, providing baby with the comfort of his or her own space. To convert it to the co-sleeper mode, you will just have to unzip a panel on one side and fit the sleeper to your bed in a snug manner. This awesome co-sleeper bassinet is lightweight, comes with safety, and 6 position adjustments for height. The sleeper comes with an incline feature that helps to create a gentle angle for when the baby requires relief from a cold or congestion. Removable covers are included, and these can be machine washed. 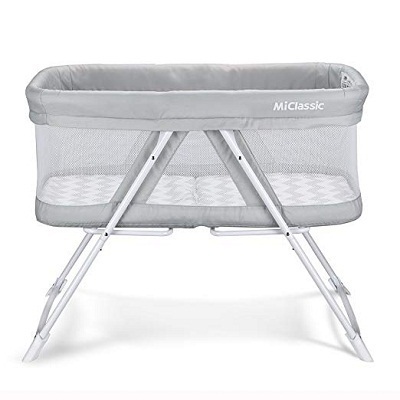 The bassinet comes with only 2 wheels and you would have to lift one side and roll to move it from one room to another. The Beside Me bassinet will give you ample bonding time with your little cherub even from the comfort of your own bed. Your little one will still be a master of his or her own space and you will be able to feed, soothe, and watch over the baby as you rest. The Dream On Me bassinet from Karley is a lightweight, simple yet versatile product. It comes with a 1” thick mattress pad and a sleeping pad. Your infant will get an uninterrupted rest in this bassinet which is easily portable from one room to another. The bassinet comes with a quick fold system. It is designed for babies up to 25 pounds in weight and this sets it apart from most products which offer a 15 pound weight limit. It features a double side canopy for ease of access. It has a storage basket for baby’s essentials. It allows for gentle rocking. Mattress and sheets are not included, and you will have to purchase them separately. 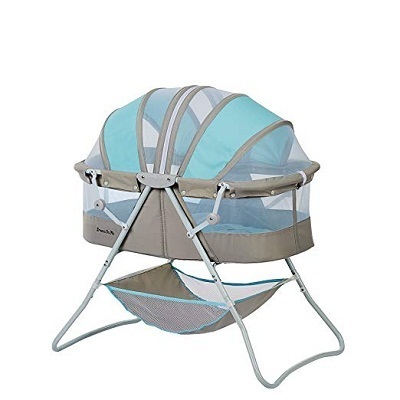 This bassinet comes in a range of colors like blue, periwinkle, pink and gray, aqua, and rose. You get to choose according to your décor and according to your baby’s gender if you wish. This elegant bassinet from Green Frog is a cradle and a safe sleeping option for your infant. Its comfy, cozy, and unbelievably snug. It comes with a low height for visibility and is great from a mobility aspect too. Watch your little angel sleep so serenely as if they were lying on clouds of cotton candy and cuddle bears. The fabric is a breathable soft fabric with mesh windows on 2 sides for baby to view outside. It has a fabulously easy assembly and comes with mattress and sheets included. The bassinet is easily portable with a lift and glide option on customized wheels. The bassinet comes with a cradle to rock and soothe your baby. The mattress and sheets are machine washable on a gentle cycle. You would have to discontinue using the cradle once bay is able to sit up, kneel or stand without help. The Lily Pod comes in a please and sophisticated gray color which will blend in with your home décor. The design floors you with simplicity and urbane style. Babyhood can be overwhelming for both infant and mother, and we hope that we have eased a tad bit of the tension by bringing you this well-thought and studied list of remarkable baby bassinets that are available in the market.